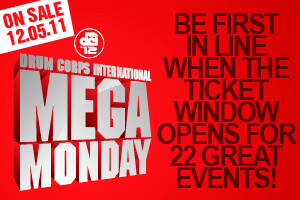 Get your tickets NOW to some of the hottest events of the 2012 Drum Corps International Tour! The following tickets are now available through the DCI Box Office or Ticketmaster where noted. Follow the links to each event for ticket prices, seating charts, and ordering information. Read more about the 101-event 2012 DCI Tour Schedule. Drum Corps International is proud to offer tickets to the all-age Drum Corps Associates World Championships taking place over the 2012 Labor Day Weekend through the DCI Box Office. Read more about the 2012 DCA World Championships at DCACorps.org.